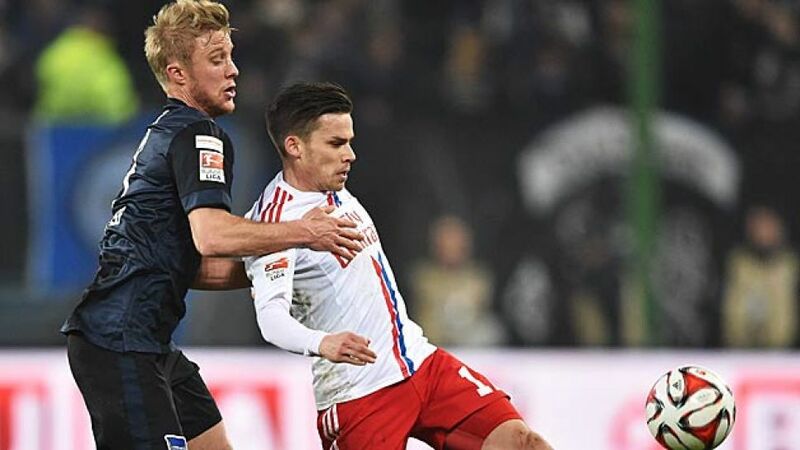 Hamburg - Sebastian Langkamp's late goal gave Hertha Berlin all three points against ten-man Hamburger SV in the Matchday 26 opener on Friday night. In a game typical of two sides fighting for their lives near the foot of the Bundesliga, and fearful of conceding any territory to their opponents, they cancelled each other out until a red card for Cleber gave Hertha their chance. Langkamp took it with an 83rd minute header, earning the Old Lady all three points. Stieber found himself in an unusual position of trying to beat the man who could be picking him for Hungary next week, but he seemed to relish the occasion. The Hamburg forward had the first effort of the game with his shot taking a deflection off John Anthony Brooks and looping towards Thomas Kraft's goal, forcing the Hertha custodian to track back and tip the ball over. Hertha and Hungary coach Pal Dardai watched on with mixed feelings - given his side's struggles in attack, he perhaps wished he was able to call upon Stieber's services on Friday night and not only during the break for internationals. It was the 26-year-old again at the heart of HSV's most promising moments as they stepped up their attempts to take the lead, Rafael van der Vaart shooting wide left and Ivica Olic missing the opposite post with a header. In spite of Dardai's gestures for his charges to show more pride and passion, it was not until the very last minute of the first half that they managed to keep Rene Adler alert, although Änis Ben-Hatira's effort did not even make it as far as the Hamburg goalkeeper with a defensive block keeping Berlin at bay and ensuring the hosts went in at the break goalless for their third home game in a row. Hertha showed a few encouraging signs at the start of the second half, clearly having taken on board the indications their head coach was trying to get across throughout the first half. They gave Adler his first touch of the ball through Salomon Kalou's close-range header, which the former German international goalkeeper pounced on. Pierre-Michel Lasogga's introduction off the bench with just under half an hour to go saw a little more life creep into the game with the 50,000 fans packed into the Imtech-Arena trying to play their part too. Lasogga had his chance to become Hamburg's hero when Olic beat the offside trap and squared for the former Hertha forward, who saw his effort blocked. At the other end, Hertha substitute Genki Haraguchi almost let a chance get away from him before testing Kraft, while Olic found the side-netting with his next shot. Hamburg's hopes of finding a winner were dealt a blow when Cleber picked up a second yellow card with under ten minutes remaining and it proved costly indeed with his absence in Hamburg's rearguard punished by Langkamp, whose header from Marvin Plattenhardt's free-kick clinched three precious points for Hertha.